As an interim dean, industrial engineer Verna M. Fitzsimmons led Kent State University through tremendous change. Now she'll be taking Kansas State University Salina into the future. Fitzsimmons was selected as K-State Salina's CEO and dean. She will succeed Dennis Kuhlman, who retires June 30. "Verna Fitzsimmons is a proven academic leader who has the experience to keep K-State Salina on our path to become a top 50 public research university by 2025," said K-State President Kirk Schulz. 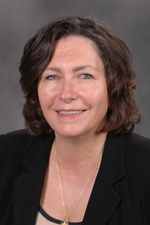 An associate professor at Kent State's College of Applied Engineering, Sustainability and Technology, Fitzsimmons served as interim dean from 2008 to 2010. She successfully led the college through the transition to applied engineering and a responsibility-centered management funding model. She also led efforts to select and install the $1.5 million Air Traffic Control Simulation Lab. "As our first campus outside of Manhattan, K-State Salina has symbolized the university's momentum for the future," said April Mason, Kansas State University provost and senior vice president. "With Verna Fitzsimmons leading the campus, we look forward to all of the ways K-State Salina will help us achieve our goal for 2025." Fitzsimmons' background in academia includes teaching at Case Western Reserve University, Cleveland State University, Wright State University's Lake Campus and the Milwaukee School of Engineering. Fitzsimmons has a vast background in industry as well. She is a process strategy coach for Kinetic Insights LLC in Columbus, Ohio, and has her own coaching and consulting business in which she helps operations improve to align with strategic plans. Her industrial background also includes experiences as a product safety engineer, safety and regulatory engineer, and an international liaison engineer. "It is an honor and I am humbled to serve as the next CEO and dean for Kansas State University Salina," Fitzsimmons said. "I look forward to building on the memorable legacy of Dennis Kuhlman. Together in partnership with Kansas State University under the leadership of President Schulz and Provost Mason, along with the community of Salina, we will take K-State Salina to even greater heights to advance the visionary goals for 2025. I wish to thank everyone for being so welcoming." Fitzsimmons has been published in peer-reviewed/refereed journals like the International Journal of Modern Engineering and Technology Interface. She also has presented her work at conferences across the country. Her success in external fundraising includes a $13.5 million in-kind software grant for the College of Technology, the largest in Kent State University history. Fitzsimmons earned a bachelor's, master's and doctoral degree in industrial engineering, all from the University of Cincinnati.